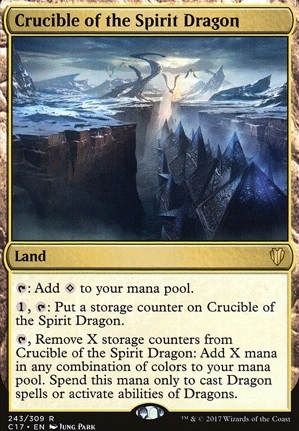 Can Crucible of the Spirit Dragon mana used for Face down (Manifest) Dragon? Crucible of the Spirit Dragon + Facedown Morph Dragons? 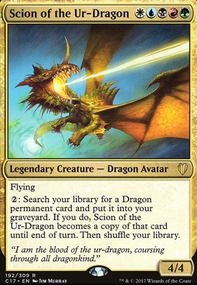 @Demon86RM, Foul Renewal is a neat 2 for 1 but I don't like that the removal is conditional on having an appropriately-large creature in my graveyard. When I need removal, I just want that thing gone. @IAmTheWraith, good call, Dragonstorm 's back in. @MattN7498, when you're editing your deck, there's a checkbox option called "Show other decks" that will automatically show your other decks on the left-hand side. No HTML required. 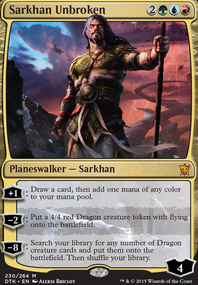 Sarkhan's Unsealing is pretty cool, just hard to find something weak to take out and make room for it. I'll keep it in mind next time I want to replace something. 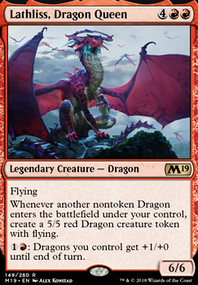 @DwaginFodder, I've got a lot of controlling players in my playgroup and after the first few turns, people generally have the available to prevent me from using Rhystic Tutor . I originally skipped over Crucible of the Spirit Dragon because it's slow but you're right, it's nice when I'm not curving out perfectly, or later game when I just have the to spare. Added it in! Crucible of the Spirit Dragon ? 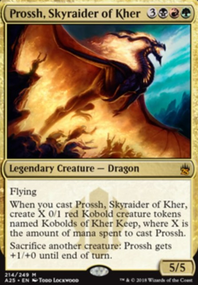 Seems pretty good - if you have extra mana lying around put it into this guy, if you don't it just taps for a colorless. Not to mention it's very flavorful. Crux of Fate and Crucible of the Spirit Dragon are some ideas. Also, you seem very concerned with Niv's mana cost, so why do you have so many lands and artifacts that produce colorless mana? 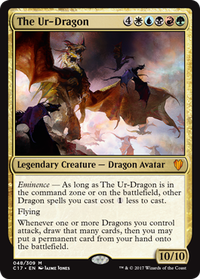 Also, Crucible of the Spirit Dragon and Haven of the Spirit Dragon are worth a shot for your commander mana fixing. I'd recommend running a Crucible of the Spirit Dragon. It has helped me when my early game plays aren't getting drawn, and you can always add the counter at an opponents end step so you can leave something untapped for responses on their turn.